Spray vehicle down with water to get rid of dust. 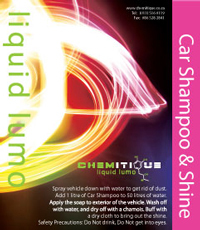 Add 1 litre of car shampoo to 50 litres of water. Apply the soap to the exterior of the vehicle. Wash off with water and dry off with chamois. Buff with a dry cloth to bring out the shine. A fragrance explosion to enhance your office or home. A general purpose dish washing liquid with a squirt of color and a burst of fragrance. and apply with a sponge or rag. Cleanse while helping your hands regenerate and replenish moisture. mag wheels and chassis. It may also be used to clean upholstery and carpets. that will leve the room with a pleasant fragrance. This powerful disinfectant and deodoriser is ideal for use in kitchen drains, bathrooms, dustbins and toilet areas.